Discussion in 'Spigot Plugin Help' started by zNeXzCC, Sep 16, 2018.
so i made my main and i wanna run a a other class. what do i need to do in the main class sorry im new on dev. This will be loaded done automatic when you put this in the start of the JumpPads.class. If you are talking about methods, you should put the method in your onEnable in your Main.class. For example, your method in JumpPads.class. 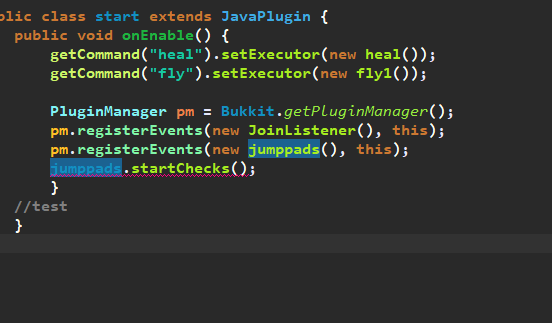 And you want to activate this method in the Main.class when the plugin starts up.